If you’re looking for a little guidance on how to make Christmas gift boxes for children, you have definitely come to right place. It’s amazing to think about the incredible ministry behind the Christmas shoeboxes that Operation Christmas Child gives away every year. Who would have ever thought that a simple shoebox could be transformed into a Christmas gift box containing not only fun items for children but also very necessary items that they can use in their everyday lives? If you want to get involved this year, it’s pretty easy–and a lot of fun–to fill an empty shoebox with gifts for a needy child. A Christmas gift for children you don’t know might seem challenging. First, decide whether you want to create a box that’s for a boy or a girl. That will narrow down your options. We pack boxes for children who are my children’s ages. That way, my kids feel really involved. Plus, I know if my kids like the toys, then the children we are purchasing the gifts for will like them too. If you don’t have any kids, borrow a few from family or friends and go shopping! The more people that get involved, the more fun it will be. Your kids will love learning about the Christmas boxes with these FREE printable coloring pages. Try to go for about half fun things and half practical things as you fill your box. I’ve got tips for how to get all those great ideas packed in your Christmas Box HERE. In the photo at the top of this post, you’ll see that I had the blessing of distributing these Christmas gift boxes with Operation Christmas Child when I went to Ecuador with Samaritan’s Purse. See what happens to those Christmas Boxes for kids HERE. 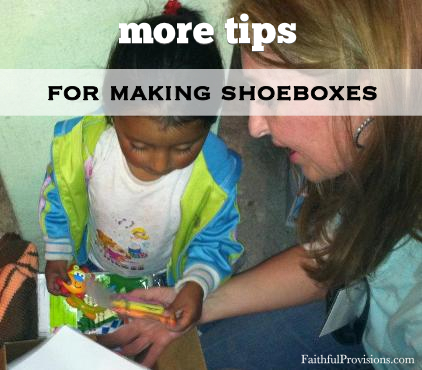 Not sure what to pack in your shoebox? See my list of 101 Gift Ideas for the children’s Christmas shoeboxes HERE. I’ve read several of your post about the Operation Christmas Child shoe boxes and I think they are all so great! I love the suggestions about what to include and also found the post about how to track your box really interesting! I didn’t know that was an option before! I am definitely looking forward to getting some boxes together myself and I’ll make sure to use your posts as a guide. Thanks!